What are fillers and volumizers? As a person ages, skin loses fluid and collagen, leading to the development of fine lines and deep-set wrinkles. Fillers and volumizers replace the lost tissue and fill out the face to reduce the signs of aging. There are a variety of options for fillers and volumizers to help reduce superficial fine lines, address facial folds and crevices, and replace lost volume. What do fillers and volumizers improve? Every time a person expresses emotions, the delicate muscles of the face create lines in the skin that can deepen into permanent wrinkles as a person ages and loses facial volume and collagen of the skin. The lines can create a permanent appearance of stress or fatigue. Smooth or reduce the appearance of facial lines. Replace the volume a person's facial contours. Increase the volume of a person's lips. This is a minimally invasive procedure that can be done in the office. In most cases, the area to be filled is numbed. The material chosen as a filler is carefully injected from a small cannula into the selected areas of the face. ALMI: As of 2017, ALMI is a new, brand-named facial volumizing procedure. It involves grafting a small amount of fat from another part of the body, mechanically processing it into its smallest form and, through tiny injections, using it to fill out facial wrinkles and areas of the face that need additional volume. Because it utilizes a patient's own fat, it has bio hormonal benefits that improve the health of the skin. Also, the ALMI process of mechanically breaking down the natural fat into its smallest-particle form allows opportunities for a long-lasting, smooth finish. Kybella: Kybella is an injectable treatment that reduces the appearance of fat below the chin, or a double chin, as it has been called. 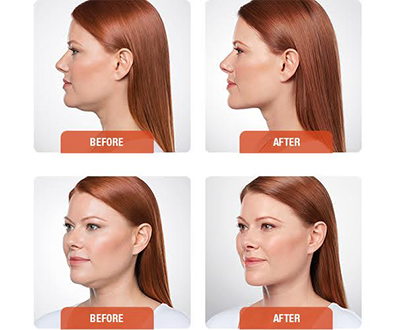 Kybella is an FDA-approved prescription medicine that helps reduce submental fullness below the chin by destroying fat cells there. 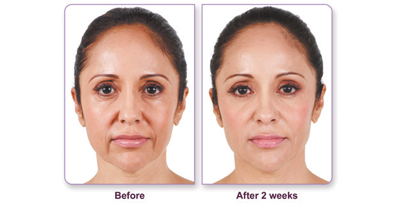 Juvederm: This brand offers a family of injectable products to address wrinkles. It is well-suited for reducing lines beside the nose and mouth and increasing volume in the cheeks and other areas. It is recommended to avoid strenuous physical activity for at least a couple days, but a person may resume other activities immediately. Are fillers and volumizers covered by insurance? These procedures are cosmetic and not covered by insurance companies. 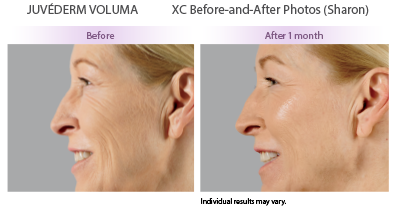 (Juvéderm Ultra XC® , Juvéderm Ultra Plus XC® and Juvéderm Voluma XC® ) This family of products helps to reduce wrinkles, especially along the sides of your nose and mouth, and sculpt the cheeks and other areas that have lost volume over the years. Model was treated for parentheses lines (JUVEDERM© Ultra, 0.5 mL; JUVEDERM© Ultra Plus, 1.5mL), marionette lines (JUVEDERM© Ultra, 0.3 mL; JUVEDERM© Ultra Plus, 0.5 mL), and corners lines (JUVEDERM© Ultra, 0.2 mL; JUVEDERM© Ultra Plus, 0.2 mL). Model was paid for her appearance. Photo taken 2 weeks after treatment. These photos are not of a clinical trial subject. Unretouched photos of paid model taken 1 month after treatment. A total of 3.5 mL of JUVÉDERM VOLUMA XC was injected into the zygomatic arch, anteromedial cheek, and submalar region. In the clinical trial, the total volume injected ranged from 1.2 mL to 13.9 mL, with a median of 6.6 mL, to achieve optimal correction for all 3 subregions.